Hello and welcome to Decorama Ltd.
We have over 30 years’ experience in the decorating trade, so if you need a painter and decorator to carry out work in your home then look no further than us. We provide a wide range of painting and decorating services including interior and exterior painting, industrial painting, artexing/coving, wallpapering, and tiling for walls and floors. If you're based in the area of Weston-super-Mare, Bridgwater, Bristol, Clevedon, or Burnham-on-Sea, Decorama Ltd are here to help! Whether you would like a free quotation, or just need a reliable decorator to carry out painting, wallpapering, wood treatment, or general renovations, please contact us for more details. Our trusted and reliable painter and decorator team endeavour to complete all decorating work on time and on budget, guaranteeing 100% customer satisfaction. Please see our reviews page to find out what other customers think of our painting and decorating services. We’re both Which? 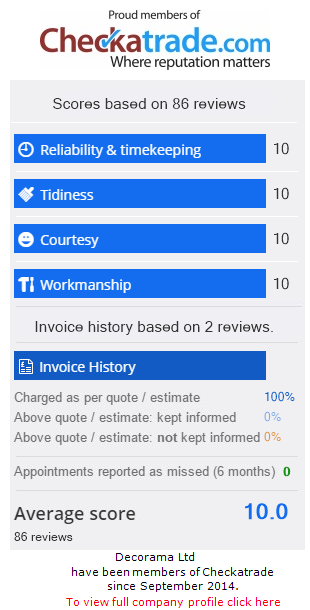 Trusted Traders and proud members of checkatrade.com. If you’re in need of a painter and decorator to give your home or office a fresh new look, get in touch with us today to discuss your requirements. At Decorama Ltd we offer a comprehensive range of painting and decorating services. Whether you want a complete exterior makeover or just a new feature wall for a room, our painters and decorators will complete the decorating job to the highest of standards. Give us a call today to find out more about our painting and decorating services. In Need of Tiling Services? Our professional and experienced tilers can fix and supply wall and floor tiles for any room, as well as patios and porches. We offer a variety of high quality and cost-effective tile products including ceramic, limestone, porcelain, travertine, marble, stone, slate, glass, and granite tiles. So whatever style you're after for your home or business, Decorama Ltd. can deliver the perfect solution. Our other tile services include under tile heating and tile accessories. If you're near Weston-super-Mare, Bridgwater, Bristol, Clevedon, or Burnham-on-Sea. please don't hesitate to contact us for a free estimate on 01934 820320. "I have always received good service from Decorama Ltd. Timing and quality have always met my expectations and everything is communicated in a professional and timely manner."